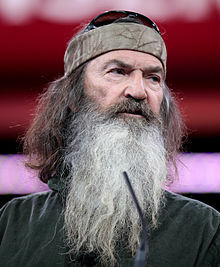 Phil Alexander Robertson is an American professional hunter, businessman , and reality television star on the popular television series Duck Dynasty. He is also featured on the television show Buck Commander, a hunting program on the Outdoor Channel. Phil Alexander Robertson (born April 24, 1946) is an American professional hunter, businessman (Duck Commander), and reality television star on the popular television series Duck Dynasty. He is also featured on the television show Buck Commander, a hunting program on the Outdoor Channel. He attended Louisiana Tech University, where he played football. He received a master's degree in education and spent several years teaching. Robertson was the subject of controversy after a 2013 interview he did with GQ magazine, where he said that homosexual behavior is sinful. As a result, A&E suspended him from Duck Dynasty. Facing what was reported as "a strong backlash from Robertson's supporters", A&E lifted the suspension after nine days.